24 Apr 2019 - Lebanon’s Minister of Defence, Elias Bou Saab, led a delegation today to the UNIFIL Headquarters in Naqoura and visited areas along the Blue Line, where he was briefed on UNIFIL’s work, together with the Lebanese Armed Forces (LAF), in maintaining the existing calm. 02 Apr 2019 - UNIFIL Head of Mission and Force Commander Major General Stefano Del Col today chaired a regular Tripartite meeting with senior officers from the Lebanese Armed Forces (LAF) and the Israel Defence Forces (IDF) at the UN position in Ras Al Naqoura. 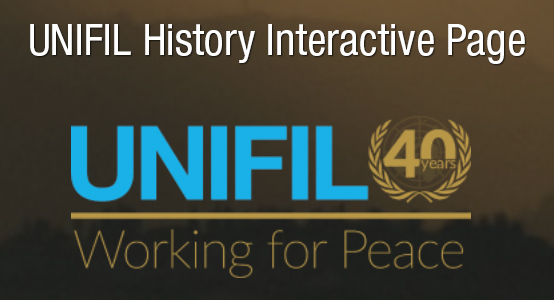 19 Mar 2019 - Today, the United Nations Interim Force in Lebanon (UNIFIL) marked the 41st anniversary of its establishment with a ceremony at its Headquarters in Naqoura. This was to highlight the commitment of the international community and the United Nations to the Lebanese state and its people in providing a safe and calm environment for the local population in southern Lebanon. 14 Mar 2019 - The United Nations Under Secretary-General for Peace Operations, Jean-Pierre Lacroix, yesterday concluded his 5-day visit to Lebanon, where he held talks with top Lebanese officials in the capital, Beirut, and saw first-hand the crucial work of UNIFIL peacekeepers in the southern part of the country. 13 Feb 2019 - UNIFIL Head of Mission and Force Commander Major General Stefano Del Col today chaired a regular Tripartite meeting with senior officers from the Lebanese Armed Forces (LAF) and the Israel Defence Forces (IDF) at the UN position in Ras Al Naqoura, calling on the parties to ensure that all the activities along the Blue Line are predictable in order to avoid misunderstandings and prevent tensions. 11 Feb 2019 - UNIFIL Head of Mission and Force Commander Major General Stefano Del Col today held his first meeting with the newly appointed Lebanese Minister of Defence Elias Bou Saab in Beirut to discuss the situation in the UNIFIL area of operation and the continued cooperation with the Lebanese Armed Forces (LAF). 10 Jan 2019 - UNIFIL’s Head of Mission and Force Commander Major General Stefano Del Col today chaired the first regular Tripartite meeting of 2019 with senior officers from the Lebanese Armed Forces (LAF) and the Israel Defence Forces (IDF) at the UN position in Ras Al Naqoura, with a focus on discussions regarding tunnels and ongoing engineering works near the Blue Line. 24 Oct 2018 - The United Nations Interim Force in Lebanon (UNIFIL) today marked the 73rd United Nations Day at its headquarters in Naqoura by reaffirming the Mission’s strong commitment to maintain and solidify the existing calm in south Lebanon. 23 Oct 2018 - UNIFIL Head of Mission and Force Commander, Major General Stefano Del Col, had separate meetings today in Beirut with Lebanese President Michel Aoun, the Speaker of Parliament Nabih Berri and Prime Minister designate Saad Hariri.